To be presented to The Genealogical Department Daughters of The American Revolution Library, Washington, D.C. compliments of The Wellsboro Chapter. Mrs. Darwin Neal, Regent, Mansfield, Pa. Please accept my apologies, for typing errors in this book, found while indexing. If I don’t get them corrected, please do so. p.126 - Sisson - Son - Putnam C.
The omissions are due to blotting out mistakes and forgetting to return for corrections. 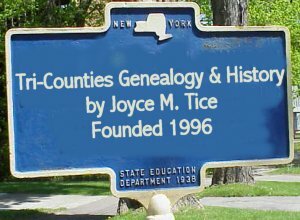 Abstracts Of Wills and Administrations Of Tioga County, PA.
Book one, copied by Lola Wetherbee Franke, Wellsboro. Rhoda ENGLISH Ladd of Wellsboro, Pa.
Spelling of names and places are copied as in the books, though they may look like mistakes. In some cases, the name is spelled several different ways. Father and son, will have different spellings. The date at the heading of will or administration is the probate date. Date of death was not required until 1874. I have put in, in quotes dates of death taken from our cemetery books, where I was sure. Bonds, Bail, and Sureties were money put in for security by the administrators. 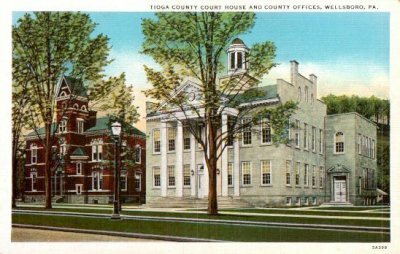 The first book of wills of Tioga County only went to 1860 and the index was poor. It also included some Orphans Court, naming guardians for minor children. The Registers Docket has interspersed with the wills this information. Note from Joyce: I have sent Nicole Parker my copy of this book and she is typing them up for us as her time permits. Coming Soon ! !